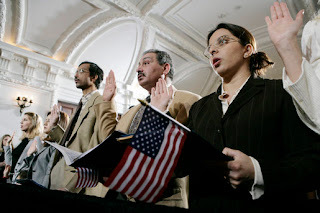 Following is our annual two-part summer feature on the 100 questions U.S. naturalization candidates can be asked during a citizenship interview, as provided by the U.S. Citizenship and Immigration Service. Here are the first 50; next week’s issue will contain the remaining 50. 6. What is the one right or freedom from the First Amendment? 9. What are the two rights in the Declaration of Independence? 11. What is the economic system in the U.S.? 13. Name one branch or part of government. 17. What are the two parts of the U.S Congress? 25. Why do some states have more representative than other states? 28. What is the name of the current U.S. president? 29. What is the name of the current U.S. vice president? 31. If the president and vice president can no longer serve, who becomes president? 36. What are two cabinet level positions? 38. What is the highest court in the U.S.? 39. How many justices are there on the Supreme Court? 40. Who is the chief justice of the U.S. Supreme Court now? 45. What are the two major political parties in the U.S.? 49. What is one responsibility that is only for U.S. citizens? 50. Name one right only for U.S. citizens. 1. The Constitution; 2. Sets up the government, defines the government, protects basic rights of Americans; 3. We the People; 4. A change (to the Constitution), an addition (to the Constitution); 5. The Bill of Rights; 6. Speech, religion, assembly, press, petition the government; 7. 27; 8. Announced our independence (from Great Britain), declared our independence (from Great Britain), said that the U.S. is free (from Great Britain); 9. Life, liberty, pursuit of happiness; 10. You can practice any religion, or not practice a religion; 11. Capitalist economy, market economy; 12. Everyone must follow the law, leaders must obey the law, government must obey the law, no one is above the law; 13. Congress, legislative, president, executive, the courts, judicial; 14. Checks and balances, separation of powers; 15. The President; 16. Congress, Senate and House (of Representatives), (U.S. or national) legislature; 17. Senate and House (of Representatives); 18. 100; 19. Six; 20. Answers will vary; 21. 435; 22. Two; 23. Answers will vary; 24. All people of the state; 25. Because of the state’s population, because they have more people, because some states have more people; 26. Four; 27. November; 28. Barack Obama; 29. Joseph (Joe) Biden; 30. the vice president; 31. the speaker of the House; 32. the President; 33. the president; 34. the president; 35. Advises the President; 36. Secretary of agriculture, secretary of commerce, secretary of defense, secretary of education, secretary of energy, secretary of health and human services, secretary of homeland security, secretary of housing and urban development, secretary of the interior, secretary of labor, secretary of state, secretary of transportation, secretary of the treasury, secretary of veterans affairs, attorney general, vice president; 37. Reviews laws, explains laws, resolves disputes, decides if a law goes against the Constitution; 38. Supreme Court; 39. Nine; 40. John Roberts; 41. To print money, to declare war, to create an army, to make treaties; 42. Provide schooling and education, provide protection (police), provide safety (fire departments), give a driver’s license, approve zoning and land use; 43. Answers will vary; 44. Answers will vary; 45. Democratic and Republican; 46. Democratic; 47. John Boehner; 48. Citizens 18 and older (can vote), you don’t have to pay (a poll tax) to vote, any citizen can vote. (women and men can vote), a male citizen of any race (can vote); 49. Serve on a jury, vote in a federal election; 50. Vote in a federal election, run for federal office.